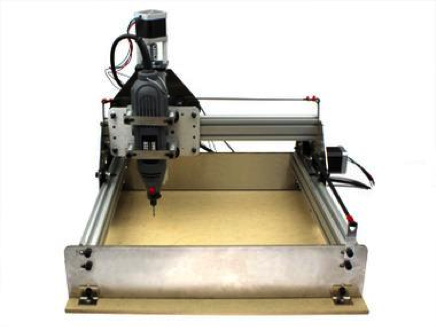 CNC milling is a cutting process in which material is removed from a block by a rotating tool. In CNC milling the cutting tool is moved in all three dimensions to achieve the desired part shape. The cutting tool usually rotates about an axis that is perpendicular to the table that holds the material to be cut. A milling machine looks somewhat like a drill press at first glance. A cutting tool protrudes down from a rotating spindle. A block of material is placed on a moving table below the cutter. While the cutting tool turns, a computer controls the vertical (Z axis) motion of the cutter and the horizontal (X and Y axis) motion of the block of material. The cutter is guided to move through the material, removing portions to create shapes.